The Collegian sports staff looks into the future to forecast the events of the 2018-19 winter months. The 2015 National League MVP turned down the Nationals’ offer of 10 years and $300 million because he thought he could sign somewhere else for north of $400 million, which would be the largest guaranteed contract in sports history. Unfortunately, he failed to account for the fact that he’s not actually that good of a player, only accumulating more than 5.0 WAR in two of his seven pro seasons. Team after team will laugh in Harper’s face as super agent Scott Boras presents his ridiculous proposal, until finally he is forced to lower his price to something more befitting a popular, yet totally-league-average starter. At that point though, front offices will be so fed up with Harper’s greed and general douchebaggery that they all collectively refuse to sign him. He will eventually find his way onto his childhood favorite team, the Yankees, after they offer him an opened bag of Lays’ dill pickle-flavored potato chips, but will be benched in favor of Luke “Essence of Man” Voit. Russian women gymnasts know they just need a little something to get a leg up on the U.S. and win again, and this offseason they plan to try a unique type of training. Inspired by the new Ocean’s 8 movie, Russian gymnasts have decided the best way to prepare for next season is to try a few art heists. This controversial new method will lead to great successes on their part, because nothing prepares gymnasts for the pressure of competitions like the pressure of a life sentence. Expect to see great things from these gymnasts next year, and to see more forgeries in art galleries near you. As rivals Borussia Dortmund climb, the Bavarian giants fall like they’re inversely related properties. Dortmund will win the Bundesliga, the Pokal and the Champions League. Meanwhile Bayern Munich will be struggling to stay in the top tier of German football. In the end it will all come down to a heated battle between the perennial champions and a power like Stuttgart where Manuel Neuer will watch three goals sail by him as his team plummets to the 2. Bundesliga. In a shocking move, Lionel Messi, who has pretended to be injured with a broken leg for several weeks, will have turned out to be secretly conspiring with and persuading the rest of the Spanish leagues into seceding from Madrid and uniting under the orange, yellow and blue banner of the Catalan people. Following the coaching exodus and general turmoil in the Browns’ front office, the NFL owners will decide to temporarily remove the Browns from the AFC North, creating a new division named the “AFC WEast,” in order to give the Browns a fair shake at making the playoffs. However, given the uncanny ability of the Browns to get in their own way, this will backfire as they beat themselves out for their guaranteed playoff spot. They will elect to send only Baker Mayfield and the ghosts of QBs past to represent their newly-founded division in the playoffs. 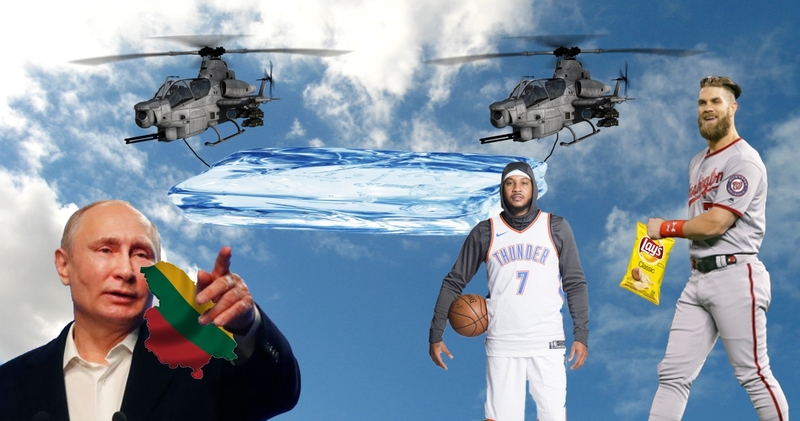 As the basketball world finally realizes that Carmelo Anthony is an honest-to-goodness liability, his time on an NBA roster will reach a swift end. By Christmas, the Rockets will have released Melo (incidentally sparking an entirely unrelated 19-game winning streak). Still unsatisfied that he never won a championship, Anthony will sign up for his local YMCA rec league as a player-coach, where he will proceed to jab-step pot-bellied fathers of four into oblivion. He will cap the season by draining the winning three-pointer over the opposing team’s 52-year-old, 6’1” center, capping an inspiring 14 for 39 shooting night. For the first time ever, Russia will go to the Olympics without the help of performance-enhancing drugs. Naturally, they will then take over Lithuania when the news breaks. Lithuania, or Ex-Russia No. 3, will ask for help from other nations, only to be denied because the UN has some rubles on the games. About three months later, Russia will be under investigation for doping in the Olympics, and no one will be surprised that they lied about being clean. FC Wembly, under a pen name, will beat the Red Sox 28-3 in the World Series. When signing up for the Premier League, all of the team showed up to the World Series instead, a mistake that has been made at least six times before. FC Wembly will then adopt the name: FBaseball Club Wimbleedoodles, or FC Wimble for short. The World Series will be played again in winter after the Wimbleedoodles challenge the Red Sox to a final match. The famous teamster will crawl out from under the San Francisco Giants’ home stadium. The political climate will draw the man out from where the mob cut him into pieces and buried him in 1982. His left leg will be on the base path towards first, with his right arm rounding second. His right leg will be just past the shortstop, and his left arm will be stuck at third. His torso will be in the batter’s box. His head will be separated from his torso by only a few inches, lying on top of home plate. In a surprising environmental move, hockey will be banned in the U.S. and Canada starting in January 2018. Because of the amount of electricity needed to keep the stadium so cold, it will no longer be allowed. Additionally, because the global ice reserves are dwindling, it will no longer be acceptable to use ice for anything besides mixed cocktail drinks for the nations’ elite.